WCC 2006: Kramnik breaks through… evens score! The World Championship Chess match took a turn today as Vladimir Kramnik emerged victorious over Veselin Topalov in game 10 of their contentious match. Topalov had prophetically stated that the match was not over. He could not be more accurate as Kramnik held an advantage in the opening and was a clear pawn up. Topalov had a chance to simplify with 24...Bxb5 25.axb5 Qxb5 26.Qxb5 Rxb5 27.Ra2. Instead the Bulgarian erred with 24…f6? and his position soon fell like a house of cards after 25.Nd7! (25.Qg4!?) Rf7 26.Nxb6 Rxa7 27.Nxd5 netting another pawn. Topalov sought to complicate matters, but Kramnik played simply and won more material. With the board liquidated and no more tricks up his sleeve, Topalov resigned. Sources report that he was visibly upset after the loss. The current scenario will allay the notion that Kramnik is psychologically wrecked after the earlier controversies. It may also take some of criticism off of Topalov and prevent any further delays in the match. There is one uncertainty. Should the remaining two games end in draws, there is a question as to whether the tiebreak will be played with the game five forfeit being under protest. Will the two gentleman part ways in the event of a 6-6 tie? There is a rest day on tomorrow, but there is no question that each camp is discussing these possibilities. 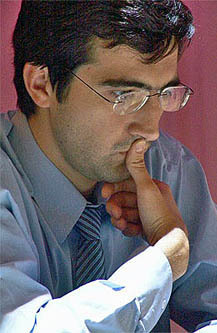 Vladmir Kramnik eased doubts of his psychological endurance.